The VM10 series Valve Islands have been discontinued, we currently do not have a replacement product. 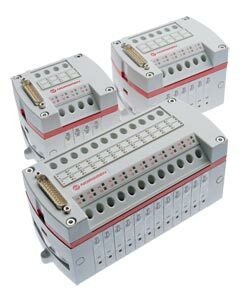 The VM10 Series valve islands are stocked in common configurations and are available in 2- or 4-way directional control valves. These valves are well suited for operation with PLC’s with low power consumption. The VM10 valve islands provide high flow for a compact valve bank, 0.44 Cv from the 4-way directional (5/2) control valve. All valve islands share a common supply and exhaust channel. Electrical connections are made easy with 25 or 44 pin D-sub cable connections. Made-to-order valve islands are available which may include mixed valve types, dual pressure supply, different or multiple tubing connections, internal/ external piloting, or a pneumapole (quick disconnect) base with bottom or side tubing connections for panel mount or through enclosure mounting applications. The 2-way (2 x 3/2) style valve contains two independent 2-way valves (3/2) per valve slice. The 4-way (5/2) style valve is known as a 4-way directional control valve, for controlling double-acting pneumatic cylinders. These valves banks are normally closed, internally piloted solenoid valves that share common ports. A data sheet is available on our FTP site with additional information. Spare valve slice for expansion, 2x3/2 2-way control valve, NC. Two independant valves per slice. 참고: Pre-configured valve stations include as standard a left hand feed, right side blocked 5/16 port end plate. Comes with optional DIN rail mount kit, and equipped with 2 X 3/2 double valve solenoids. Multipole sub-connector for easy connection and hookup are also standard. Two open stations for expansion flexibility are included on each island. Does NOT include a pneumapole base with valve stations.